The charge transfer and photovoltaic performance of dye-sensitized solar cells (DSSCs) can be improved by increasing the conductivity of photoanodes used in their fabrication. 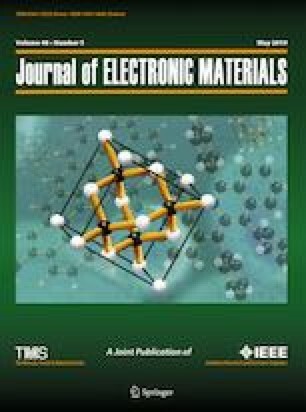 To increase the conductivity of the photoanode, Nb transition metal was doped into a titanium dioxide (TiO2) crystal lattice by using two different precursors, such as NbCl5 and Nb(OEt)5. Nb doped TiO2 (Nb:TiO2) and mesoporous (mp)-TiO2 nanomaterials were synthesized via the sol–gel method by mixing crosswise effectively with two magnets in different two beakers for 24 h. DSSCs were fabricated by using mp-TiO2 and Nb:TiO2 photoanodes sensitized with Z907 dye. The scanning electron microscopy (SEM) images unknown in scientific literature are getting darker with the decreased of the surface porosity and, while they are getting brighter with the increased the surface porosity. The ultraviolet–visible (UV–Vis) graphs of photoanodes showed the Burstein-Moss (B-M) effect occurred by optic band gap energy (EOBG) enlarged due to high Nb doping level. Moreover, this effect, especially in the UV region of the electromagnetic spectrum, was seen in IPCE spectra of DSSCs due to the electronic band gap of TiO2 tailored and split via Nb doping by mixing crosswise effectively with magnets, too. The dark current (IDC) of DSSCs decreased with Nb doped in the TiO2 lattice. The highest short circuit current (Isc) values of DSSCs were observed for optimum Nb doping levels. The recombination resistance (Z 2 ′ ) at TiO2/dye/electrolyte interface of DSSCs increased with increasing Nb doping level. As a result, it was seen as a good correlation between EOBG, Z 2 ′ and Isc values that changed with Nb doping level. We acknowledge the Farabi Exchange program supported by the Council of Higher Education in Turkey (YOK) for giving support to Dr.Nermin KUTLU to conduct her research at Ege University Solar Energy Institute under supervision of Assoc. Prof. Ceylan ZAFER. A. Manikandan, A. Saravanan, S.A. Antony, and M. Bououdina, J. Nanosci. Nanotechnol. (2015). https://doi.org/10.1166/jnn.2014.9804. A. Manikandan, J. Judith Vijaya, S. Narayanan, and L. John Kennedy, J. Nanosci. Nanotechnol. (2014). https://doi.org/10.1166/jnn.2014.8499. A. Manikandan, J. Judith Vijaya, C. Ragupathi, and L. John Kennedy, J. Nanosci. Nanotechnol. (2014). https://doi.org/10.1166/jnn.2014.8515. Y. Fukai, Y. Kondo, S. Mori, and E. Suzuki, Electrochem. Commun. (2007). https://doi.org/10.1016/j.elecom.2007.01.054. S. Yun, J. Lee, J. Chung, and S. Lim, J. Phys. Chem. Solids (2010). https://doi.org/10.1016/j.jpcs.2010.08.020. B. O’Regan and M. Gratzel, Nature (1991). https://doi.org/10.1038/353737a0. M. Pan, H. Liu, Z. Yao, and X. Zhong, J. Nanomater. (2015). https://doi.org/10.1155/2015/974161. C. Zhang, S. Chen, L. Mo, Y. Huang, H. Tian, L. Hu, Z. Huo, S. Dai, F. Kong, and X. Pan, J. Phys. Chem. C (2011). https://doi.org/10.1021/jp2024318@proofing. R.C. Da Silva, E. Alves, and M.M. Cruz, Nucl. Instrum. Methods Phys. Res. Sect. B (2002). https://doi.org/10.1016/s0168-583x(02)00541-4. K. Karthik, S.K. Pandian, and N.V. Jaya, Appl. Surf. Sci. 256, 6829 (2010). https://doi.org/10.1016/j.apsusc.2010.04.096. T. Nikolay, L. Larina, O. Shevaleevskiy, and B.T. Ahn, Energy Environ. Sci. (2011). https://doi.org/10.1039/c0ee00678e. T. Hitosugi, H. Kamisaka, K. Yamashitai, H. Nogawa, Y. Furubayashi, S. Nakao, N. Yamada, A. Chikamatsu, H. Kumigashira, M. Oshima, Y. Hirose, T. Shimada, and T. Hasegawa, Appl. Phys. Express (2008). https://doi.org/10.1143/apex.1.111203. B. X. Lu, X. Mou, J. Wu, D. Zhang, L. Zhang, F. Huang, F. Xu, and S. Huang, Adv. Funct. Mater. (2010). https://doi.org/10.1002/adfm.200901292. P.S. Archana, R. Jose, T.M. Jin, C. Vijila, M.M. Yusoff, and S.J. Ramakrishna, J. Am. Ceram. Soc. (2010). https://doi.org/10.1039/c4cp00034j. T.T. Nguyen, T.V. Nam, and B.T. Cong, Chem. Phys. (2014). https://doi.org/10.1016/j.matchemphys.2013.12.025. H. Liu, H.T. Ma, X.Z. Li, W.Z. Li, M. Wu, and X.H. Bao, Chemosphere (2003). https://doi.org/10.1016/s0045-6535(02)00486-1. L. Xiong, J. Li, B. Yang, and Y. Yu, J. Nanomater (2012). https://doi.org/10.1155/2012/831524. K.H. Ko, Y.C. Lee, and Y.J. Jung, J. Colloid Interface Sci. (2005). https://doi.org/10.1016/j.jcis.2004.09.009. H. Yu, S. Zhang, H. Zhao, G. Will, and P. Liu, Electrochim. Acta (2009). https://doi.org/10.1016/j.electacta.2008.09.025. S. Hoang, T.Q. Ngo, S.P. Berqlund, R.R. Fullon, J.G. Ekerdt, and C.B. Mullins, Chemphyschem. (2013). https://doi.org/10.1002/cphc.201201092. S. Liu, E. Guo, and L. Yin, J. Mater. Chem. (2012). https://doi.org/10.1039/c2jm15965a. E. Uyanga, A. Gibaud, P. Daniel, D. Sangaa, G. Sevjidsuren, P. Altantsong, T. Beuvier, C.H. Lee, and A.M. Balagurov, Mater. Res. Bull. (2014). https://doi.org/10.1016/j.materresbull.2014.08.035. E. Burstein, Phys. Rev. 93, 632 (1954). https://doi.org/10.1103/PhysRev.93.632. T.S. Moss, Proc. Phys. Soc. Lond. Sect. B (1954). https://doi.org/10.1088/0370-1301/67/10/306. S. Ito, T.N. Murakami, P. Comte, P. Liska, C. Gratzel, Md. K. Nazeeruddin, and M. Grätzel, Thin Solid Films (2008). https://doi.org/10.1016/j.tsf.2007.05.090. A. K. Chandiran, F. Sauvage, M. Casas-Cabanas, P. Comte, S. Md. K. Zakeeruddin, and M. Grätzel, J. Phys. Chem. C (2010). https://doi.org/10.1021/jp106058c. Y. Shu, A. Mikosch, K.N. Winzenberg, P. Kemppinen, C.D. Easton, A. Bilic, C.M. Forsyth, C.J. Dunn, Th.B. Singh, and G.E. Collis, J. Mater. Chem. C (2014). https://doi.org/10.1039/c4tc00002a. R.N. Bhowmik, M.N. Murty, and E.S. Srinadhu, PMC Phys. B (2008). https://doi.org/10.1186/1754-0429-1-20. Y. Chiba, A. Islam, Y. Watanabe, R. Komiya, N. Koide, and L. Han, Jpn. J. Appl. Phys. (2006). https://doi.org/10.1143/jjap.45.l638. J.C.E. Bocardo, M.A.L. Heredia, H.A.C. Hernández, A.M. Rámirez, and J.M.A. Robles, AZojomo (2005). https://doi.org/10.2240/azojomo0165. J. Arbiol, J. Cerdà, G. Dezanneau, A. Cirera, F. Peiró, A. Cornet, and J.R. Morante, J. Appl. Phys. (2002). https://doi.org/10.1063/1.1487915. A.M. Ruiz, G. Dezanneau, J. Arbiol, A. Cornet, and J.R. Morante, Chem. Mater. (2004). https://doi.org/10.1021/cm0351238. X. Yin, C. Battaglia, Y. Lin, K. Chen, M. Hettick, M. Zheng, C.-Y. Chen, D. Kiriya, and D. Javey, ACS Photonics (2014). https://doi.org/10.1021/ph500153c. A.V. Manole, M. Dobromir, M. Gîrtan, R. Mallet, G. Rusu, and D. Luca, Ceram. Int. (2013). https://doi.org/10.1016/j.ceramint.2012.11.066. M.S. Kim, M.J. Jo, D. Lee, S.-H. Bae, J.H. Shin, and B.C. Lee, Bull. Korean Chem. Soc. (2013). https://doi.org/10.5012/bkcs.2013.34.5.1397. K. Bapna, D.M. Phase, and R.J. Choudhary, J. Appl. Phys. (2011). https://doi.org/10.1063/1.3624775. W. Zeng, T. Liu, and Z. Wang, Physica E (2010). https://doi.org/10.1016/j.physe.2010.10.010. A. Abidov, B. Allabergenov, J. Lee, H.-W. Jeon, S.-W. Jeong, and S. Kim, I. J. M. M.M., (2013). https://doi.org/10.7763/ijmmm.2013.v1.63. B. Choudhury, M. Dey, and A. Choudhury, Int. Nano Lett. (2013). https://doi.org/10.1186/2228-5326-3-25. M.Z. Musa, M.H. Mamat, M.H. Abdullah, M.F. Malek, A.M. Nor, N.A. Rasheid, U.M. Noor, and M. Rusop, Shuser 2012 (2012). https://doi.org/10.1109/shuser.2012.6268896. K. Tennakone, C. Thaminimulla, and W. Kiridena, Langmuir (1993). https://doi.org/10.1021/la00027a019. Y. Ma, J. Zhang, B. Tian, F. Chen, and L. Wang, J. Hazard. Mater. (2010). https://doi.org/10.1016/j.jhazmat.2010.06.045. T. Kogo, Y. Ogomi, and S. Hayase, Mater. Sci. (2009). https://doi.org/10.1007/978-3-540-70758-5_10. A. Shokuhfar, M. Alzamani, E. Eghdam, M. Karimi, and S. Mastali, Nanosci. Nanotech. (2012). https://doi.org/10.5923/j.nn.20120201.04. M.A. Sanchez-Garcia, X. Bokhimi, and A.E. Jimenez-Gonzalez, Nanoscale Res. Lett. (2015). https://doi.org/10.1186/s11671-015-0991-3. S.G. Kim, M.J. Ju, I.T. Choi, W.S. Choi, H.J., Choi, J.B., Baek, and H.K. Kim, RSC Adv. (2013). https://doi.org/10.1039/c3ra42081g. G. Wang, L. Wang, S. Zhuo, S. Fang, and Y. Lin, Chem. Commun. (2011). https://doi.org/10.1039/c0cc04948d. X. Zhang, S.-T. Wang, and Z.-S. Wang, Appl. Phys. Lett. (2011). https://doi.org/10.1063/1.3635788. J.H. Park, J.H. Noh, B.S. Han, S.S. Shin, I.J. Park, D.H. Kim, and K.S. Hong, J. Nanosci. Nanotechnol. (2012). https://doi.org/10.1166/jnn.2012.4920. E.M. Barea, C. Zafer, B., Gültekin, B. Aydın, S. Koyuncu, S. İçli, F. Santiago, and J. Bisquert, J. Phys. Chem. C (2010). https://doi.org/10.1021/jp1055842. T. Kinoshita, K. Nonomura, N.J. Jeon, F. Giordano, A. Abate, S. Uchida, T. Kubo, S II. Seok, Md. K. Nazeeruddin, A. Hagfeldt, M. Grätzel, and H. Segawa, Nat. Commun. (2015). https://doi.org/10.1038/ncomms9834. M. Yang, B. Ding, and J-K. Lee, J. Power Sources (2014). https://doi.org/10.1016/j.jpowsour.2013.06.016.